Brilliant work! I really like this depiction of Glaurung. 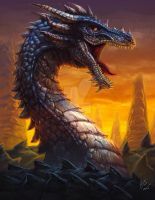 If the dragons were created by Illuvatar, this is what they probably would've looked like. This is brilliant work. Nienor looks utterly hypnotized, completely lost. It's like the fog is emanating from the dragon! I have used this in a post I did on "Of Túrin Turambar." Hope that's OK.
No, Nienor! Don't talk with strangers!! I love how you made Glaurung. Truly he looks like the father of dragons. And Nienor looks so lost and bereft. I have seen a lot of Tolkien art, and this is one of the best. Cool. I love how massively heavy you made him look. Very cool picture. Omg that art is really awesome and I have to read the book!! It's amazing, but Nienor was blonde. Turin thought she had her mother's hair, but she looked more like their father Hurin. Actually, he's right, Nienor, Turin's sister, "was tall, and her eyes were blue, her hair fine gold, the very likeness in woman's form of Húrin her father." You're thinking of his sister. Nienor was the elf maiden who loved him. Okay, I'm going to blame lack of sleep for this one. I was thinking, "Niniel was blonde. The elf girl was the one w/dark hair." Due to the excuse listed above, I mixed up the name Finduilas with Nienor. Wow. Fail on so many levels. it's like how I imagined it while reading. This looks to be a John Howe painting? wow thats so dramatic! amazing! Haha, I saw this and thought.... why that looks like something from the Silmarillion.... and then I saw the title. Exciting! I just read this part of The Silmarillion. Very close to how I imagined it. One of the coolest depictions of this scene and of Glaurung that I have seen. Great work! This is just amazing! I absolutely love it! J.R.R. Tolkien's "Children of Hurin"
If I remember correctly, it takes place "in the land beyond the Gray Havens" during the First Age, as opposed to LOTR's Third Age timeline. I've been told Children of Hurin is also touched upon in The Silmarillion, though I don't know by how much since I haven't read that one yet. In short, yes, Children of Hurin is part of the LOTR universe, just in a different location and much earlier timeframe. Why doesn't someone develop a "like again" or "add to favorites again" button? Oh! It is fine work! The use of perspective and atmospheric perspective (the mist) gives this a level of realism that sends a chill up my spine. As if I'd been on a walk in the woods on a misty morning and just happened to stumble by this. Severely creeped out, in the best possible (OMG! It's a dragon!) way. And the name sound familiar...is this based off the Children of Hurin?